Cact. Hort. Dyck. (1849) 8, 82 (1850); et: K. Schum. Gesamtbeschreib. Kakt. 511 (1898). 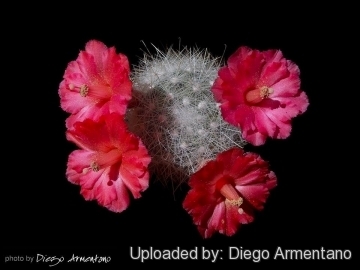 Mammillaria senilis Photo by: Andrea B. Origin and Habitat: Chihuahua, Jalisco and Sinaloa, Mexico. Altitude: 2400-2800 metres above sea level. Habitat: Grows on moss-covered boulders in pine forests at high altitudes. 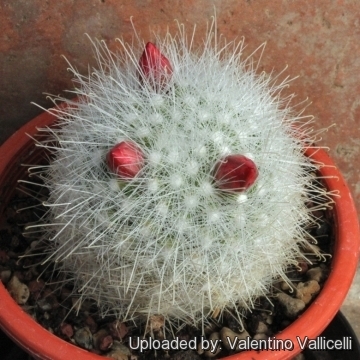 Mammillaria senilis var. albiflora hort. Mamillopsis senilis var. albiflorus hort. 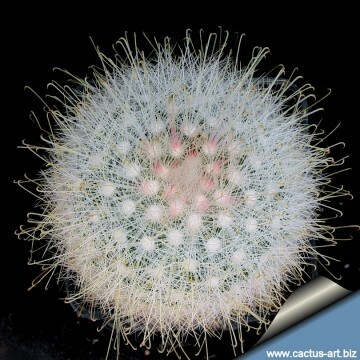 Description: Mammillaria senilis is a very ornamental cactus species that looks like a cotton ball with small but deadly sharp, glistening hooked white spines and many white radials. The large red flowers are very showy too. Habit. Branching basally to form clumps. Stems: Globose to cylindrical, up to 15 cm tall and 10 cm wide. The tubercles are conical, obtuse with wool and bristles in the axil. Without latex. Radial spines: 30-40, thinner than the centrals, white, to 20 mm long. Central spines: 4-6, white with yellow tips, upper and lower ones hooked. Flower: Usually orange-red, but also yellow or near white to pink (rare), 60 - 70 mm long, 55-60 mm in diameter. Floral tubes slender, scaly, to 4 cm long. Blooming season: February and March. Fruits: Silvery red to greenish white. Mammillaria senilis Lodd. ex Salm-Dyck: looks like a cotton ball with small but deadly sharp, glistening hooked white spines and many white radials. 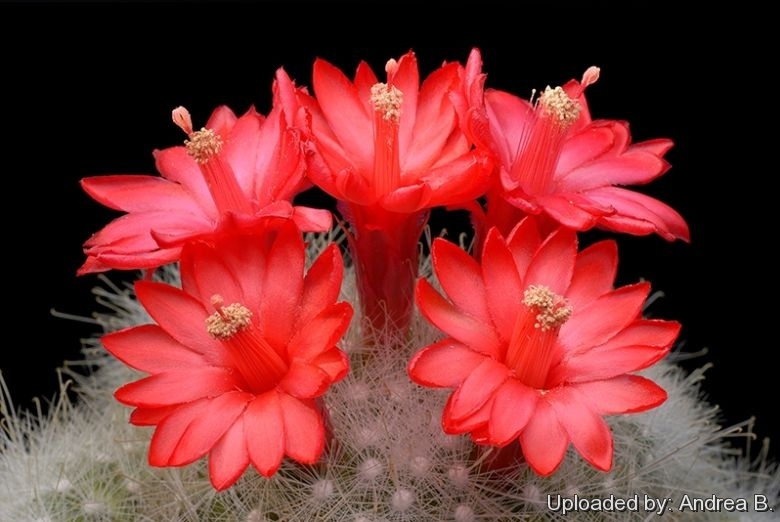 The flowers are large red and very showy. Distribution: Chihuahua, Jalisco and Sinaloa. Mammillaria senilis var. albiflora hort. : differs from the type only for the colour of the flowers, which are white instead of red, they are very showy too. 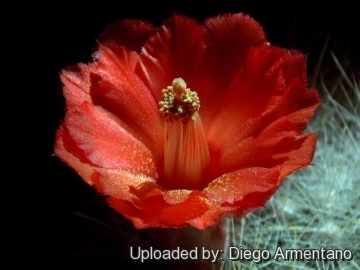 Notes: Mamilopsis (Mammillaria) senilis, was placed in a separate genus due to various differing characteristics involving flower shape (The flowers have a characteristic zygomorphic structure - unlike the other mammillarias - with tube possessing obvious "scales" - i.e. fleshy reduced sepaloids - and by the apparent lack of fragrance in the flower) , size, seed and pollen morphology. The genus Mamilopsis includes only Mamilopsis senilis. 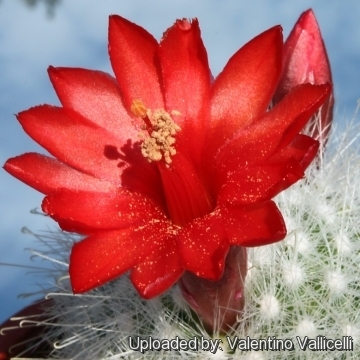 Notice that contrarily to the name Mammillaria, Mamillopsis has only one 'm'. 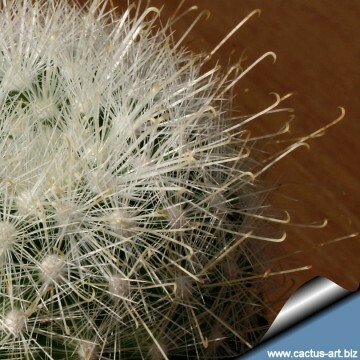 - This is a very ornamental plant that looks like a cotton ball with small but deadly sharp, glistening hooked white spines and many white radials. 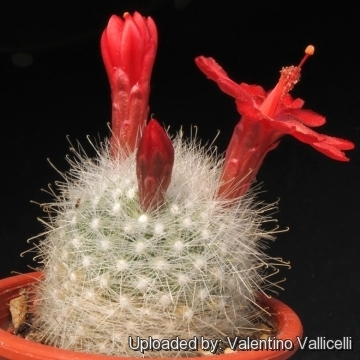 Photo by: Andrea B.
Cultivation and Propagation: Mammillaria senilis is a slow growing species and one of the most difficult Mammillaria to keep and grow that needs lots of light with ample airflow. Water regularly in summer, but do not overwater (very wet-sensitively, especially in light of its small root system) Water thoroughly only if soil is dry to the touch, let soil dry in between to prevent root rot, keep very dry in winter. Use a very porous acidic potting media (Avoid to add limestone! ), with excellent drainage, as can be achieved by the addition of extra perlite or pumice. Feed with a high potassium fertilizer in summer. It is a mountain plant that prefers somewhat cooler temps and it proved to be quite frost resistant if kept dry and hardy as low as -5° C (some reports give it hardy to -10°C or less) Sun Exposure: High levels of light are needed to flower and for good spine development. Can be sunburned if moved from shade/greenhouse into full sun too quickly. During the spring it may be able to take full sun until the heat arrives at the end of spring. In an area that has hot afternoon sun, it may be able to take full morning sun, but requires afternoon shade or afternoon light shade. If grown correctly, it will reward the grower with generous displays of red flowers. 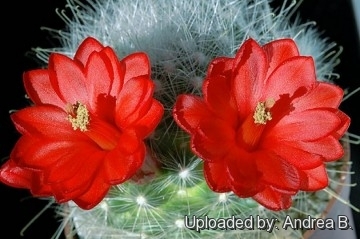 A resting period in winter and strong light are necessary so that it can flower properly. Clustering in cultivation after several years and easily flowered. For best results, use a shallow pot, and only use the smallest diameter pot that will accommodate the plant. Sensitive to red spider mite. Overhead watering is helpful in controlling mites.